Batten down the hatches and clutch your grog tight – in Drowned Horse Tavern drunken sailors meet to tell tales of shipwreck and lurking leviathans, to sing songs of adventure and loneliness, to whisper of the unfathomable sea within. PETE spins vaudeville, live music and visceral performance into a raucous evening of salty cabaret. 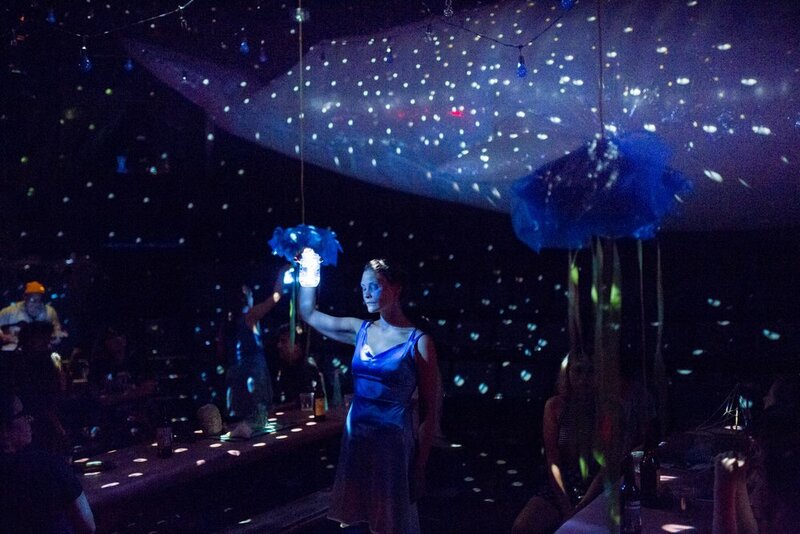 Drowned Horse Tavern is the first part of PETE’s The Journey Play Is The Whole Thing: A Constellation Of Art Events, Objects and Experience. Great songs, full of yearning and heartbreak, the life sensual and the life of privation, songs that understand that death is nearby. The show is wild and bawdy and fun. The performers -- Rebecca Lingafelter, Paige McKinney, Cristi Miles, Mark Valadez, and Amber Whitehall -- are fabulous, especially Lingafelter, who, as always, displays a phenomenal range of emotional intensity. I think the point was a basic one: Contact. We are here together, sharing our time in a state somehow cleaner, metaphorically speaking, than the one we left on the street outside. The words and the music make the same gesture, an invitation to consider things anew in this space at this time. Special thanks to: Philip Cuomo and the CoHo Theatre, Matthew Robbins, Ashton Hull, Lewis & Clark College, Reed College, Alissa Warren, Nate Cohen, Charlotte Wallis, Alice Whitaker, Nick Laycox, Molly Gardner, and Breakside Brewery.